← How to set an owner password for a pdf file using command line? In the conversion of doc to emf or docx to emf, you should choose an easy-to-use application which you can master perfectly in a short while, which will save you a lot of time in your work. Of course, if the application is powerful enough, you don’t need to do much useless operations in the conversion of doc to emf. docPrint Document Converter Professional is a such kind of application. It is a software product that dynamically converts MS Office 97/2000/XP/2003/2007, WordPerfect, AutoCAD DWG, PostScript, Adobe Acrobat PDF and many other document types to Adobe Acrobat PDF, PostScript, EPS, XPS, PCL, JPEG, TIFF, PNG, PCX, EMF, WMF, GIF, TGA, PIC, PCD and BMP etc formats. With docPrint Document Converter Professional you can convert your documents from and to 50+ formats easily. There are three available applications in docPrint Document Converter Professional. They are GUI application, command line application and virtual printer application which contains two printers—docPrint and docPrint PDF driver. The docPrint is the leading role in this article. You can not see docPrint as a virtual printer only, it also acts as a document converter. Before using docPrint, you should download docPrint Document Converter Professional at http://www.verypdf.com/artprint/docprint_pro_setup.exe and install it to your computer following the installation wizard dialog boxes. Then you can see docPrint in the printer list by clicking “Start” and clicking “Printers and Faxes” in the menu. In the beginning of the conversion of doc to emf or docx to emf, you should print the word document to docPrint to run the document converter. You should open the word document and click “File”—“Print” to open “Print” dialog box in which you should choose “docPrint” as your current printer in “Name” combo box. Then click “OK” button. The “Ctrl”+ “P” combination will also aim at the same goal. This step will be easier if docPrint is the default printer. You can only right click on the word document and choose “Print” in dropdown list to run docPrint and the “Print” dialog box will be skipped. Then you will see the dialog box named “docPrint” in which you can use three ways to open “Save As” dialog box. Please see Figure1. The first way is to click “File” and click “Save as” in dropdown list, which is the regular way. The second one is to click “Save file” icon which seems like a floppy disk framed by the ellipse in Figure1. The third one is using the quick way—the hot key “Ctrl”+ “S”. 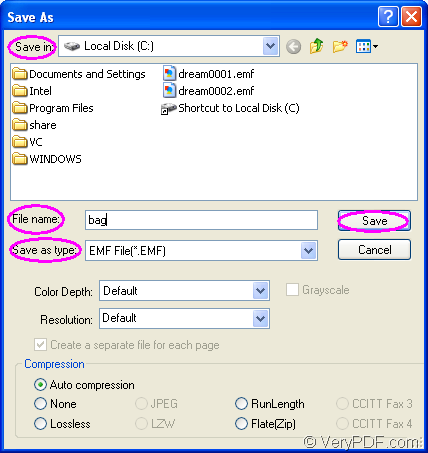 In the last dialog box in the conversion of doc to emf or docx to emf—“Save As” dialog box showed in Figure2, you can save your target file and run the conversion via the following four options. Firstly, you should select the path for the target file in “Save in” combo box. Secondly, please edit a suitable name for the target file in “File name” edit box. 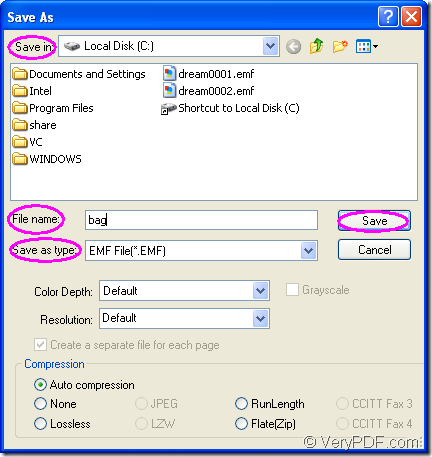 Thirdly, in “Save as type” combo box, you should choose the right output format for the target file, here please choose “EMF File(*.EMF)”. Last, please click on “Save” button. You are able to browse your target file in the specified location several seconds later. In the end of the conversion of doc to emf, you will find the steps are so easy that you can fulfill it perfectly. If you want to know more functions about docPrint, please visit http://www.verypdf.com/artprint/index.html. How to convert DOC to EMF via command line? How to convert Word to PDF and set PDF author via command line? This entry was posted in docPrint Pro and tagged doc to emf, docx to emf. Bookmark the permalink.